Hi everyone! This is Scot, the customer relationship manager at Bitcoin Depot. This is my first blog post for Bitcoin Depot. I’m going to be sharing with you the best ways to trade the cryptocurrencies we sell: Bitcoin (BTC) and Litecoin (LTC) for alternative currencies, which are commonly referred to as altcoins. I will share two ways to do this, but it is ultimately up to you to figure out which method is the best and most secure for your needs. Bitcoin Depot is not responsible for any cryptocurrencies or USD that is withheld by any exchange. Step 1: Visit a Bitcoin Depot ATM & buy either Bitcoin or Litecoin. If you already have Bitcoin or Litecoin in a personal wallet that you wish to exchange for altcoins skip ahead to the next step. We will use Litecoin for this example but the process works the same way with Bitcoin. Note: Make sure that if you purchase Bitcoin at a Bitcoin Depot ATM – you send it to a Bitcoin wallet and if you purchase Litecoin – you send it to a Litecoin wallet. The wallets I recommend are Bitcoin Depot Wallet (android only, ios coming soon) for Bitcoin and Jaxx wallet for Litecoin. Step 2: Create an account at a cryptocurrency exchange if you do not already have one. I recommend to register an account at either Binance or Poloniex, which are known to be two of the best. Transfer the Litecoin from your personal wallet to your Litecoin wallet address on your exchange account. 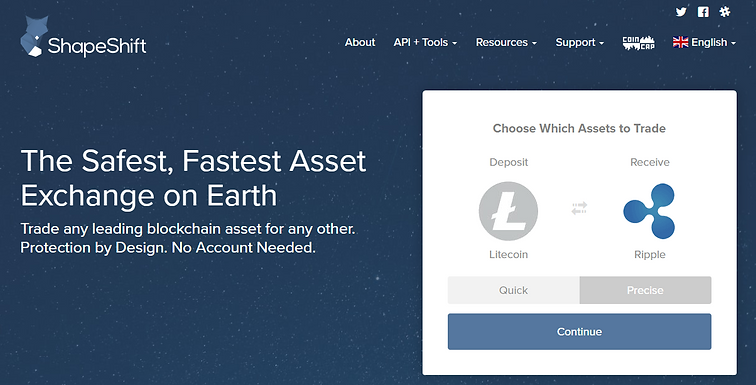 Note: You can send Litecoin directly from the Bitcoin Depot ATM to your Litecoin deposit address in your exchange account; however, Bitcoin Depot cannot reverse or change the destination of any deposit that is held as pending or unconfirmed by an exchange. If you wish to send directly to an exchange from the machine to avoid network fees, you do so at your own risk. Step 3: Trade your Litecoin for the altcoin of your choice. Another way you can transfer your crypto other cryptocurrencies is via the shapeshift.io platform. They offer both a website and Android/IOS apps that allow you to trade 40 different cryptocurrencies available (at the time of writing this post there are 72 total, but there are 32 cryptocurrencies which are listed as unavailable at this time for various reasons). To use, the Shapeshift.io platform you will send the cryptocurrency of your choice and exchange it for a different one. For this example, I’ll trade Litecoin for Ripple (XRP). Step 2: Select the cryptocurrency you will deposit and the cryptocurrency to receive. Step 3: For Ripple, I recommend to download ToastWallet if you do not already have a wallet. Next, enter in your receiving address and destination tag. Always be sure to copy & paste addresses to remove the possibility of typing the address incorrectly; however, you should still double check to make sure you have copied the correct address! Note: Shapeshift.io requires a return address just in case it can’t complete the swap and need to return your crypto, so always be sure to include the address you’re sending from in the refund spot. In this case, I will copy and paste my Litecoin address in the return section. 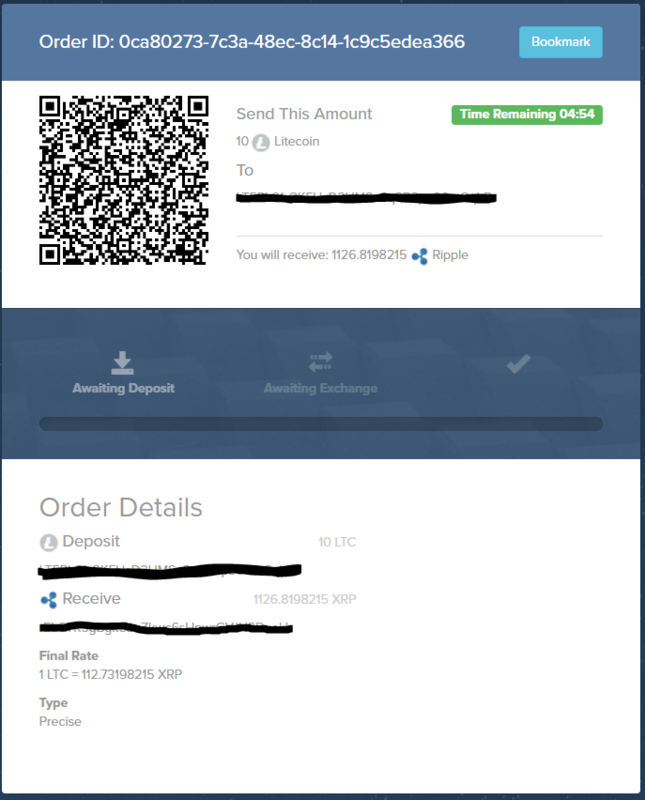 Step 4: You can choose to send a certain quantity of Litecoin, and Shapeshift will calculate how much you will receive in Ripple. 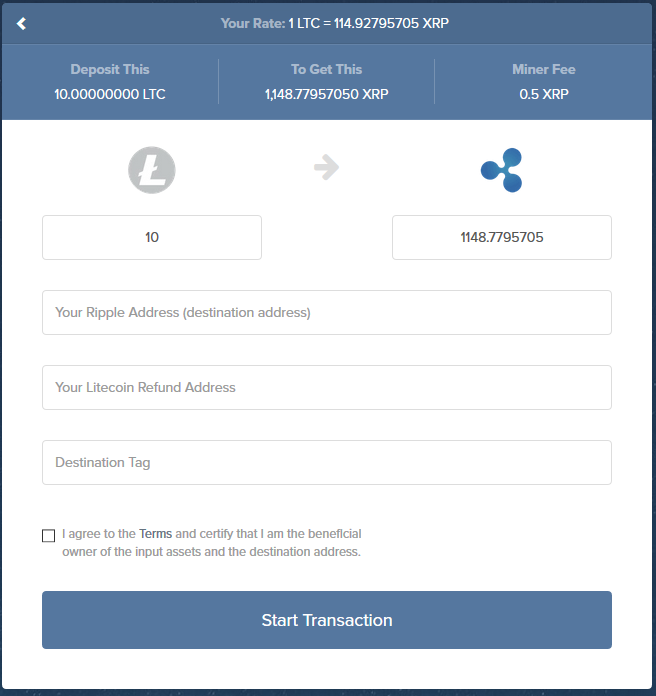 Alternatively, you can type in how much Ripple you want and Shapeshift will calculate the quantity of Litecoin you will need to send to receive the requested quantity in Ripple. Now that you have the correct desired amounts and wallet addresses entered, click “start transaction”. Note: New Ripple wallets require a minimum deposit of 20 Ripple or the exchange will fail. On this next page you have your Order ID as well as a transaction summary. You will have 5 minutes to send the selected deposit currency (in this case Litecoin) to the address provided to you by Shapeshift. 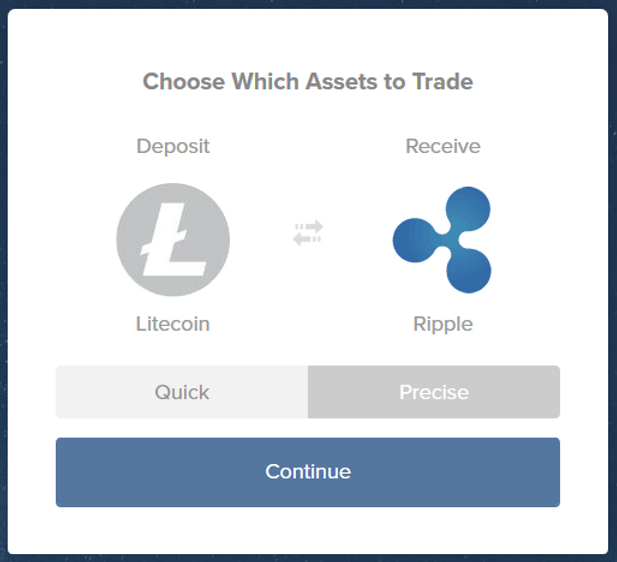 Once ShapeShift has received your Litecoin, it will exchange it for the altcoin of your choice (in this case Ripple), and then deposit into your selected address. There are many ways to monitor your altcoins. You can simply track their progress on pricing indexes such as worldcoinindex.com or coinmarketcap.com, or within the wallet or exchange you hold your coins at if it offers real time pricing. If you plan on selling your altcoins back to Bitcoin Depot, you will need trade your altcoins back into Litecoin or Bitcoin using an exchange or shapeshift. These are the two cryptocurrencies that you can sell to receive cash at Bitcoin Depot ATMs. Keep in mind, not every Bitcoin Depot ATM dispenses cash, so make sure to view 2 way Bitcoin Depot ATM locations in your area to verify you can find one that does. What is Bitcoin? – Blog post on the basics of Bitcoin. Poloniex.com – Exchange for trading cryptocurrencies. If you have any questions, concerns, or comments please feel free to let us know by sending an email to support@bitcoindepot.com with the subject “How To Buy Any Altcoins Blog Post”.